Check the status: Which coaches are staying or going? 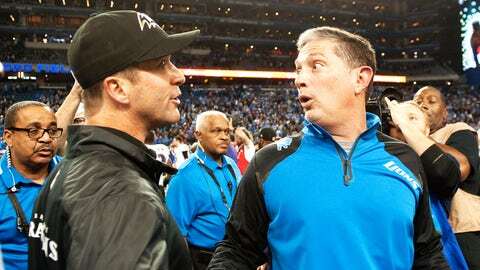 Jim Schwartz (right) got his pink slip on Monday. Well, the final downs of the 2013 NFL regular season are in the books. We know who is heading to the postseason and who will be on the golf course at this time next week. We here at FOXSports.com are keeping a close eye on every NFL head coach going into the offseason. We mark down which coaches are safe and will update when one gets fired. Safe It’s his job as long as he wants it, at this point. Oh, and the Patriots are on the short list of Super Bowl contenders again this year. Safe Despite all the rumors and hearsay, Ryan earned a reprieve after leading his team to an 8-8 record this season. Owner Woody Johnson told the media after the Jets’ win over the Dolphins that Ryan would return. Safe for now Sure, the Bills are once again in the AFC East cellar, but this is Marrone’s first season on the job. The Bills are rebuilding, and their head coach is growing along with them. Safe Sure, Lewis has never won a playoff game in Cincinnati, but his Bengals have reached the playoffs for the third consecutive season. Team ownership loves Lewis, so it’s hard to imagine that he’ll be going anywhere, regardless of what happens in the postseason. Safe This team is just one season removed from a Super Bowl victory and Harbaugh has won 10 games or more in four of his six seasons in Baltimore. The Ravens fell short of the postseason this year, but Harbaugh still has a lot of wiggle room. Safe The Steelers don’t make coaching changes very often. So, although the Black and Gold missed the playoffs for the second straight season, there’s no way Pittsburgh makes a move. Fired Chud got just one season in Cleveland and apparently that was one too many. The Browns announced that they cut ties with him after a 4-12 record in 2013. Safe Two seasons in Indianapolis and two consecutive trips to the playoffs, including a division title this year. Chuck, you’re not going anywhere. Fired Munchak had three seasons in Tennessee but his teams never showed signs of real improvement. Titans management wasn’t satisfied and cut ties with Munchak on Jan. 4. Safe Come on, even Jaguars head coaches get at least two seasons to prove themselves. Bradley’s team played hard despite a lack of talent and that should be commended. Fired Kubiak wasn’t able to make it through his eighth season at the helm in Houston as he was let go in early December. Defensive coordinator Wade Phillips has been leading the team on an interim basis. Safe The Broncos have locked down back-to-back 13-win seasons and Peyton Manning has knocked down a couple of NFL records. Yeah, Fox’s seat is the exact opposite of hot. That’s called job security. Safe What a turnaround. The Chiefs won two games in 2012 and had the first pick in the draft. In comes Reid and wow, this team is headed for the playoffs. It’s all good in KC. Safe The Bolts weren’t expected to do much in McCoy’s first season at the helm. However, here they are having clinched a playoff spot and McCoy has engineered a comeback season for QB Philip Rivers. This team has something to build on going forward. Safe Another season, another bad Oakland football team. However, it seems as though ownership is sticking with Allen and Pro Football Talk reported that he will return as head coach next season. Safe The offensive wunderkind has silenced many haters after bringing his spread attack to the NFL. Those people aren’t snickering any longer as Kelly has won a division title in his first year at the helm. In danger Jerry Jones can scream until the cows come home that Garrett’s job is safe. But we’ll believe it when we see it. Safe There was no way the Giants would fire Coughlin, not with two Super Bowl wins on his resume. Despite a lackluster 7-9 finish this season, Coughlin has said he wants to return next year and team owner John Mara said on Monday that he wants Coughlin back. So, that’s that. Safe The team went without star quarterback Aaron Rodgers for several weeks and still won the division. McCarthy did a great job holding this team together during a very rough patch. Safe Trestman was known for his offensive prowess when he was hired during the last offseason. It was an up-and-down season for the Bears, one marked by several injuries on both sides of the ball. Still, the team came close to a division crown. Not bad at all. Fired The team is loaded with talent, yet collapsed down the stretch. This team lost four straight to end the season and looked undisciplined while doing it. That ended up costing him his job as the Lions cut bait with Schwartz on Monday. | Garafolo: What’s next for Detroit? Fired One playoff appearance in four seasons? This team has had trouble finding a reliable quarterback during Frazier’s tenure, and while that might not be his fault, it could be why he ended up out of a job. | Garafolo: What went wrong? Safe This was a make-or-break season for Rivera, and he stepped up. The Panthers locked up a division title. Bravo to “Riverboat Ron” for a job well done. Safe The man has won a Super Bowl and survived a year suspension because of BountyGate. Ownership loves Payton, and he led this team to double-digit wins and a playoff berth. He’s not going anywhere. Safe Smith’s teams have reached the playoffs in four of his six seasons in Atlanta. This year was a disaster mainly because of a rash of injuries on both sides of the ball. Smith deserves a pass from ownership this year, and it’s almost certain he’ll get one. Safe This team continues to show improvement in Carroll’s fourth season at the helm. Seattle finished 13-3 to clinch a division title and home-field advantage throughout the playoffs. Carroll’s spot is secure. Safe A season removed from a Super Bowl berth and the 49ers are still a contender for the Lombardi Trophy. Harbaugh will hold this job for as long as he wants it. Safe What a job Arians has done. After taking the Colts to the playoffs last year, he arrived in Arizona and directed a previously ragtag bunch to double-digit wins and almost a playoff spot. Kudos! Safe Someone has to finish last in the division. Unfortunately, it’s Fisher’s group. Fortunately, this team is growing by leaps and bounds and who knows, after one more draft class, this team (and its emerging defense) could be a frightening bunch. Fisher will be back next season.